1. Sadness: Four Boys on the Beach. I have been away from Israel-Palestine for just over three weeks. Something that has begun to sink in over this time was just how incredibly sad this summer was. I think, while there, I felt a lot of anger and shock and exhaustion and horror and some confusion and some fear and some helplessness. Sadness was, of course, pulsating beneath it all, but over the last few days, as I’ve felt certain re-openings, the sadness swept in like a wave. The other afternoon, driving by the Bay, I found my thoughts flickering towards Ismail, Zakaria, Mohammad and Ahed Bakr, the four little boys killed on a Gaza beach by an Israeli airstrike less than two months ago. And to so many more. A crushing, breathtaking sadness. 2. Hope: 43 Elite Ex-Inelligence Soldiers Refuse. Protest can keep hope alive even as the sadness feels overwhelming. This morning, a letter written by 43 ex-soldiers from the elite Israeli intelligence unit, 8200, declaring their refusal to serve in the reserves was publicized and has been sweeping the media, both Israeli and international. Pushing back against popular perception “that service in military intelligence is free of moral dilemmas and only contributes to the reduction of violence and harm to innocent people,” the 43 Israeli dissenters articulated a graceful, empathic and pointed case (it is worth read the full letter) as to how “intelligence is an inseparable part of military control in the territories.” The letter is a powerful one, and the background of its authors- having served in one of the most respected intelligence units in the IDF- will make it hard for The Pundits to write them off. 3. Numbers: 5% Opposed the War- A Different Read. 43 doesn’t sound like a huge number. But it’s important to keep in mind that over the course of the 1960s, one of the most well-known campaigns for Civil Rights in the US was the Freedom Rides, and there were about 200 Freedom Riders, in total. And another thought on numbers: I have heard a number of people astonished and upset by polls stating that “95% of Israeli Jews supported the recent war in Gaza.” It is indeed a grim number, but for folks active on the ground, looking at the inverse of that number, namely, that 5% of Israeli Jews opposed the recent war in Gaza as it was going on, provides some measure of consolation. I do not mean this sarcastically. In a media culture saturated with government and military talking points, an education system brimming with nationalism and narrowness, and with an electoral “opposition” that ended up functioning as spokesperson for the ruling coalition, it can feel like there are no more than 10,000 or maybe 20,000 people opposed to this “war of consensus.” So to think that this survey (and survey shmurvey, anyway) tells us that at least 275,000 Israeli Jews opposed the war, and to remember that the survey only surveyed Israeli Jews, and that around another 1.5 million citizens of Israeli are non-Jewish Palestinians, and presumably the vast majority of them opposed the war, is actually… heartening. Or at least not entirely anti-heartening. And as The Scientists tell us (scientists, shmientists, but hey), “if just 10 percent of the population holds an unshakable belief, their belief will be adopted by the majority.” The key, then, becomes about organizing, mobilizing, making the shakable unshakable, turning feelings into beliefs, uplifting tired activists, supporting creative initiatives, paying attention to dissenters and marginalized individuals and communities. Easy? Nope. Possible? Maybe. Crucial to believe that it is possible and keep going? Absolutely. 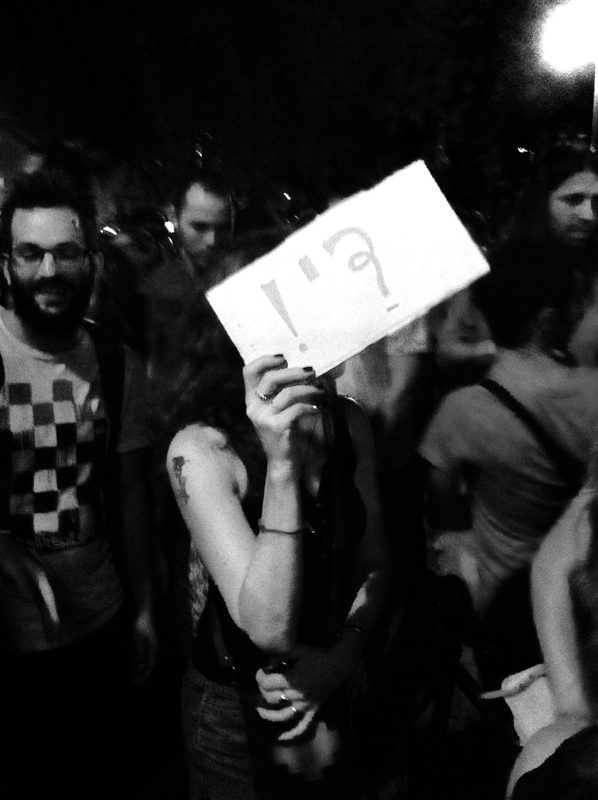 Israeli activist holds a sign saying “Enough” at a protest against the war on Gaza, Tel Aviv, July 2014. On item 3. The more important fact here, because it is overlooked as normal, is that polls in Israel routinely exclude the non-Jewish 20%. In any civilised democratic country, you poll everyone representatively, then ask the respondents if they cared to be identified by demographic criteria which you can analyse as an additional factor. Only in a racist state would you routinely exclude minorities from opinion polls. > if just 10 percent of the population holds an unshakable belief, their belief will be adopted by the majority. Hmmmm… Haredim are close to that fraction of Israel’s population, and I suppose that their beliefs are pretty unshakable, aren’t they? Although, to parry, I wonder if they even see themselves as part of the same population?